Many non-profits send out address labels as a gift to those who have donated to them. Along with the address labels they send out, usually a letter of thanks is printed on a separate sheet of paper and mailed along with the address labels. 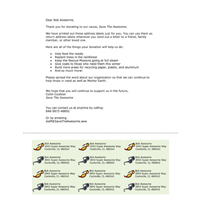 Wouldn’t be great if you, as a non-profit, could combine your thank you letter and address labels onto a single sheet for each donator? Well, you can! 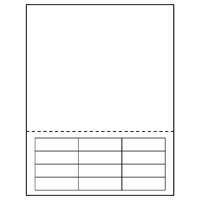 By using an integrated label sheet where the address labels are built into the paper, you can print your letter on one section of the paper and your address labels on the label section. 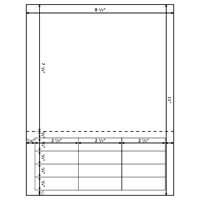 This can help non-profits save on money and time since both the letter and labels can be printed on the same sheet. 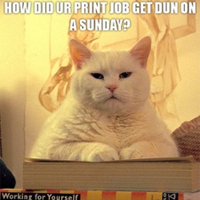 Doing so uses less paper and time isn’t wasted waiting for the second sheet to print out. 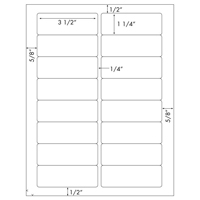 Using the blank label sheet template will help you get all of your labels in the correct spot and allow you to quickly and easily layout your letter and labels. 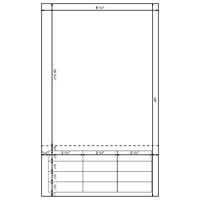 Once printed, the letter size sheet can be easily folded into thirds and stuffed in a standard envelope. When the donator receives your letter, they can easily detach it from the label section via perforation. This will make it easier for them to store the labels with their other address labels while keeping a copy of your letter for future reference. The perforation is drawn on the image to illustrate where it is in relation to the design and letter. When creating your letters in Microsoft Word, you can use a mail merge to easily create hundreds or thousands of letters at once. This will allow you to focus less on printing out the letters and labels and focus more on not only your donors themselves, but your non-profit cause as well. What else do you think this label sheet could be used for? Let us know what you think! Ready to get started printing your own? Check out this Free Guide to Get Started Today! Weekly Round-Up: Address Labels for Non-Profits, Bundle EDDMs, … How To Print Your Own Address Labels with a Letter Blank Address Labels New Address Label Sheets From Burris Now Available!